The unique interpretation of designer collections is seen best in the sartorial choices of the front row on their way in - an eclectic mix of styles, featuring both vintage and couture simultaneously, is a lesson in expressing your individuality through your clothing. 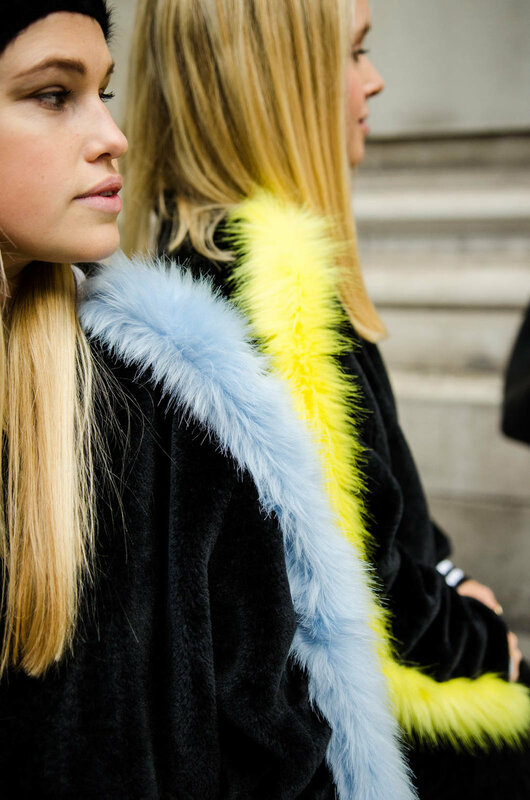 Faux fur trimmings line the shoulders of velvet bomber jackets, enhanced by pale blue and canary yellow accents. Whilst we may be adoringly watching the spring summer collections, outside the wind reminds us that floaty shapes in reality are a season away. Elasticated cuffs reference athletic garments, bringing an underground edge to the elegant coats. Warm hues of ombre red, yellow and orange have been making an appearance in the lenses of shades. The contrasting lip colour would usually overload the pieces, but when kept monochrome, they elevate an otherwise classic pairing of black trousers and a white shirt. Deconstructed to ensure modernity, the shirt falls wide at the shoulder. A paper bag edging to the trouser heightens the standardised dark slacks. One guest paired buckle cuffed neutral trousers, with tailored layers to ensure both comfort when running between shows, and an undeniable sense of thoughtful elegance. A two toned shirt over a cream roll neck recognises the unpredictability of the English weather, whilst thin and delicate silver heels lift the styling with a metallic edge.